I was so glad to finally see a challenge that I was familiar with. This month’s challenge for Recipes to Rival is shrimp dumplings! No big deal, right? WRONG! We’ve made potstickers, shumai and eggrolls, sure. But have we ever made our own wrappers? That’s where the challenge comes in. This was the first time we’ve ever made our own wrappers and it was fun and challenging and even exasperating at times. The first challenge was getting the dough thin enough. Until we figured out to not be afraid of using more flour to keep it from sticking all over the place. After we prepared the dough according to the recipe below, we divided the dough first in half then again. 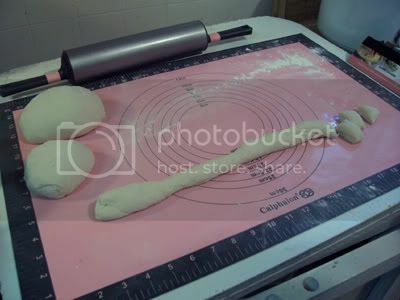 Take one fourth of the dough, roll it out into a one inch thick column then cut it into one inch lengths. Take each piece, roll it into a ball, flatten it then roll it into a 3-4 inch disk, as thin as you can get it without it falling apart. 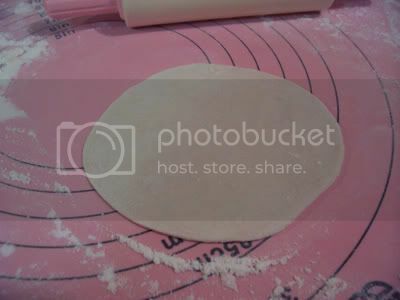 We found out that as thin as this dough is on the photo, it still wasn’t thin enough. I wish we could have rolled them out even thinner. We made two types of fillings since we have The Clone who doesn’t eat anything seafood. So we made some with just pork and some with shrimp and pork filling. How we differentiated: (the girl does not like getting confused or tricked into eating seafood) we wrapped them two ways. The round ‘sacks’ were shrimp and pork and the traditional looking half fold are the pork only fillings. Oh, I did say something about exasperating didn’t I? Here’s the deal… when you’re making your disks of dough, make sure they are more floured than you think you’d need. I decided to roll out all the dough first and stack them then fill them. After the first few disks, my daughters and I got rolling, literally and soon had a plateful of wrappers. We then sat down to start wrapping, which also was problem free (we thought). The girls wrapped the pork and I was wrapping the shrimps. Then, after about the top ten wrappers, we realize they were all stuck to each other! No matter how carefully we tried to separate the wrappers, it was just not working. They started stretching and tearing and I just wanted to cry! Instead, I just balled all the wrappers up together again and started over. So while I got started rolling wrappers over again, the girls filled them almost as fast as I could finish rolling them out. We weren’t about to stack them up again! We made these dumplings over a week ago and we just finished the last of them tonight. The first night, we steamed them just as the recipe instructed. Since we made 48 good sized dumplings, we froze the rest of them first in the cookie sheet and when they were totally frozen we transferred them to plastic freezer bags. That way, they were all separate and easy to pull out just the number we want to cook each time. 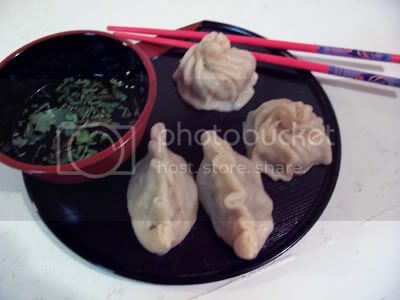 Since then, we’ve cooked dumplings soup and potstickers tonight. 1. Coat a steamer basket with a non stick cooking spray and set aside. In a small saucepan, soak the mushrooms in boiling water to cover for 15 minutes, then drain. Remove and discard the stems; cut the caps into quarters. 2. In a food processor, combine the mushroom caps, scallions, and garlic and whirl until coarsely chopped. Add the shrimp and whirl until finely chopped. Transfer to a medium bowl and stir in the turkey, soy sauce, oil, and red-pepper sauce. 3. 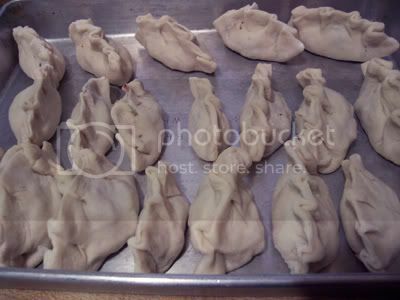 Place 1 tablespoon of the shrimp mixture in the center of each dumpling wrapper. Dampen the edges with water, the fold up the sides around the filling, pleating the edges. 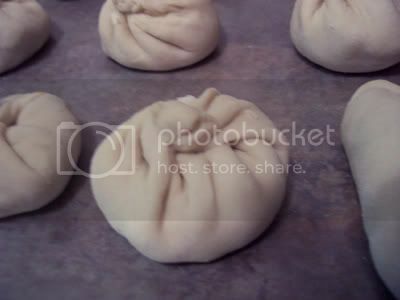 Place in the steamer basket, leaving 1/2 inch of space between the dumplings for the steam to circulate. Set over boiling water, cover, and steam for 15 minutes. 4. For the dipping sauce, in a small bowl, whisk together the soy sauce, vinegar, honey, oil, and ginger. Serve the dumplings hot with the dipping sauce. Source: Extraordinary Meals from Ordinary Ingredients, ©2007 The Reader’s Digest Association, Inc. Check out other Recipes to Rival participants. Thanks to Heather of Randomosity and the Girl and Temperance of High on the Hog for hosting this round of Recipes to Rival. Yummy Yummy Yummy. my family is now addicted to dumplings :). i should make some with shrimp sometime too. Yum! And with your pictures and instructions you make it look like a breeze, thanks! hi janet, thanks. It actually is not that hard to do. I think it will go easier the next time. you made perfect little circles! My favorite thing about this challenge was remembering when I was a young girl and I’d help my father put these together. I love that you’re making memories with your girls too. I really like the way you twisted them too. hi jen, me too! my favorite memories growing up was cooking with my dad. I know other moms who can’t stand having the kids messing around in the kitchen. I love having mine right there, getting messy with me. Your dumplings look amazing! Great job. I feel your pain about the rolled out wrappers sticking together. Luckily I only rolled out half of the dough, so I didn’t get too many of them stuck togther. You are so lucky that you had your daughters to help you make those lovely dumplings. Now I know why homemade potstickers, like pierogi, are usually made with a bunch of people, assembly-line style! They are a lot of work. hi madam chow, yeah, having an assembly line definitely helped. If I had been doing this by myself I probably would have given up when they got stuck together. Thanks, Rayrena. The girls love to help in the kitchen especially when there’s dough involved. They don’t do meat though. lol! The purse shaped ones were way easier to wrap too! I just may have to trim off some of the excess dough on top next time though. It made the dough even thicker. I’ve seen chefs who rolled paper thin wrappers, but I guess they’ve been practicing a lot more than us. lol! Those are perfect rounds you shaped. I neve get perfect rounds. They are more oval. Great job. great job! The both look delicious! I had the same problem the first time with the wrappers sticking together! Just so you know, the dough recipe was not from the Reader’s Digest cookbook. It was from the foodnetwork link for Ming Tsai. That’s why it has the (2) noted for the link. Sorry to confuse! Thanks, Heather! Ah ok… I get it now. Regardless of the source, the were still good 🙂 Thanks again for hosting R2R. i love that you had a sweat shop line too and that your daughters got in on the act. 🙂 i took me about a week to consume my dumplinhs too, but i stuck to just steaming them. it made me feel like i was having a mini-dim sum party at my place.